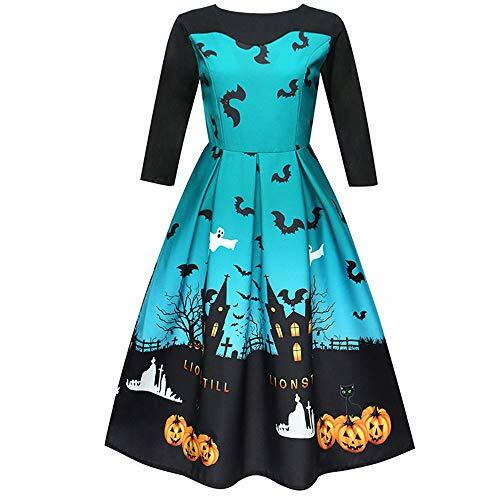 This chic dress features full of Halloween print, Three Quarter design. High waist highlights graceful body,The thin fabric used in this dress has elasticity. Size:S US:4 UK:8 EU:34 Bust:88cm/34.7" Length:100cm/39.4" Waist:73cm/28.7" Sleeve:43cm/17"
Size:M US:6 UK:10 EU:36 Bust:92cm/36.2" Length:101cm/39.7" Waist:77cm/31.2" Sleeve:44cm/17.4"
Size:L US:8 UK:12 EU:38 Bust:96cm/37.8" Length:102cm/40.1" Waist:81cm/31.8" Sleeve:45cm/17.8"
Size:XL US:10 UK:14 EU:40 Bust:100cm/39.4" Length:103cm/40.5" Waist:85cm/33.4" Sleeve:46cm/18.2"
Size:2XL US:12 UK:16 EU:42 Bust:104cm/41" Length:104cm/41" Waist:89cm/35" Sleeve:47cm/18.6"